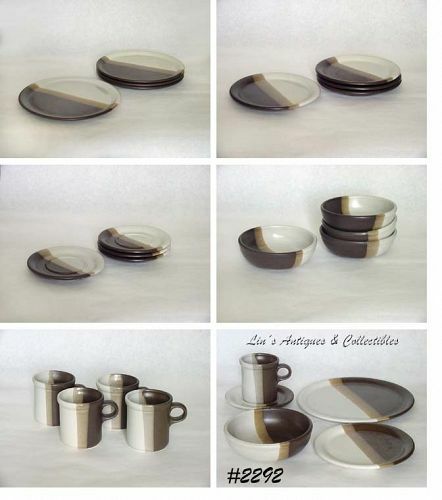 This listing has a very pretty McCoy dinnerware service for 4! This set is from the Sandstone line and has a total of 20 pieces. There are 4 cups, 4 saucers, 4 bread/dessert plates,4 salad/soup bowls, and 4 dinner plates. The bowls are marked 1413, McCoy, Lancaster Colony (mark), USA. The cups are marked 1412, McCoy, Lancaster Colony (mark), USA. The saucers, bread/desserts, and dinner plates are marked USA. All pieces are in great condition with no chips, dings, or cracks. The bowls have some very minor crazing. There are some typical McFlaws -- variances in color, etc -- nothing worthy of mention; just typical McCoy glaze imperfections.